Among the many options for roofingin a private house / cottage, gable mansard roof is the clear leader, since at a minimum cost of time and money allows you to get impressive size dwelling. This roof can be made with your own hands, as all the necessary building materials are distinguished by their availability and their low weight allows you to do without heavy construction equipment, so the question does not arise as the build gable roof terrace even for beginners "builders." In addition to its absolute practicality, mansard roof can become a kind of highlight home, highlighting it from the crowd. the most successful solutions on arrangement of "dead" zones of premises that are inevitably formed when the device attic. Important! In that case, if the attic is planneddwelling unit, kindly consider the location of windows, and the glass area should be at least 12.5% ​​of the total floor space. Important feature carefullymansard roof design is the fact that it is possible to think without the hassle of not only the technical aspects that affect the device attic gable roof. Of great importance in the perception of the house with a loft has its design. The unusual design of sloping attic, with original glazing, balconies and chimneys will certainly become a local "landmark." In addition, the device is a broken design can increase the internal space of the attic space. 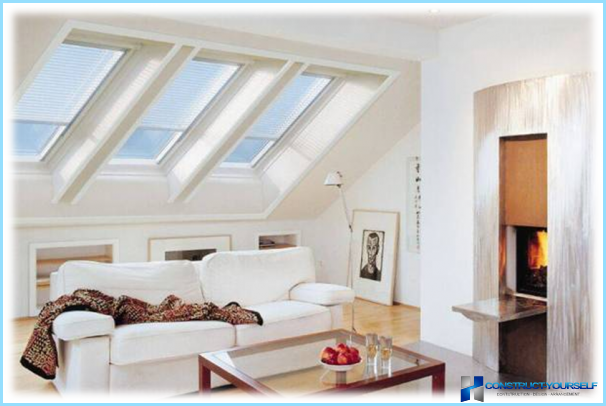 mansard roof can become a real decoration of the house. 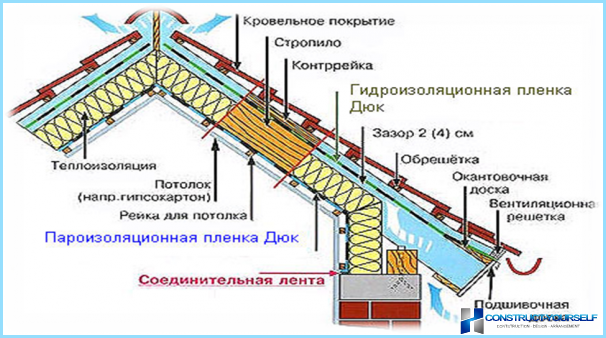 For the only drawback of such a roof can beattributed its poor thermal insulation, but thanks to modern materials, combining excellent heat - and sound insulation characteristics, this problem is solved quite easily, as a result, a new building will be the most comfortable to stay. 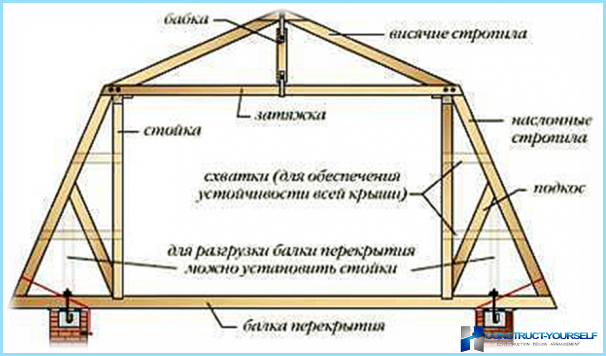 Once ready drawings gablemansard roof, you can own hands to start the installation of the rafters. For their production, it is desirable to use softwood, which is the least susceptible to rotting due to contained therein resinous substances. The same time make room climate more favorable. Nevertheless, all the wooden elements of the framework should be treated with special ognebiozaschitnymi compositions, which are applied by brush or roller in 2-3 layers, with intermediate drying. Important! 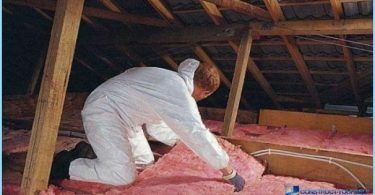 For rafters is necessary to choose only well-dried material, with relative humidity not exceeding 22% - this will eliminate the likelihood of deformation rafters after installation. Rafter attic system manufactured bytechnology "hanging" trusses that provide the necessary void in the middle of the next room. The entire structure is made of wooden bars, which is located in one plane and connected to each other at the ends in the form of a lattice. The only mainstay of the rafters are the exterior walls of the building. For making the rafters should be used bar section 150h50 mm, but for crates enough cross section 50x50 mm. Drawings pitched mansard roof, is being built with his own hands, must be sufficiently detailed to reflect the presence of the window openings, balconies, staircases, heating radiators. 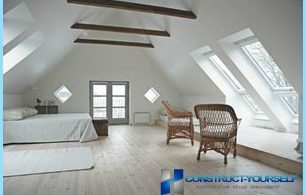 In the attic, especially ifplanned unit in the living room it can provide and the availability of the fireplace. 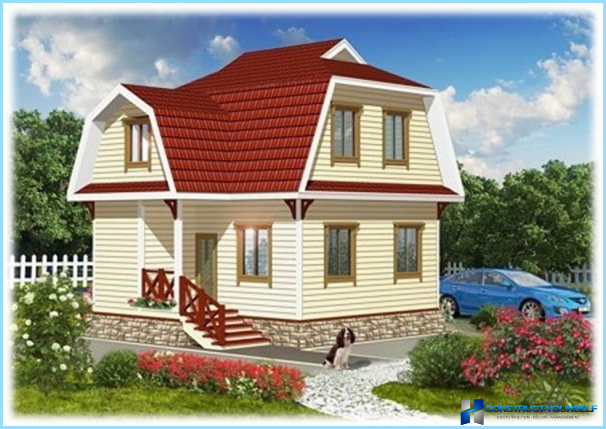 Since the introduction of any changes in the already finished design will be quite problematic, all the main points have to be reflected in the scheme of roof system gable mansard roof at the design stage. All of them are easy enough sotruss system gable mansard roof does not require additional power device elements, such as using natural tile, for example. From the selected roofing it depends on the type of suits crates. 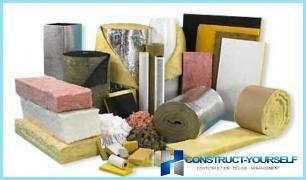 Traditional sparse, from edging boards, suitable for slate and other sheet materials. For shingles requires continuous crate, it is often made of a material such as OSB-plate, which is characterized by high strength, low weight and resistance to moisture. Basically, the circuit gable truss systemmansard roof is a kind of sandwich, which includes roofing, waterproofing and paroizoliruyuschuyu film, insulation and interior finishing coat. Any polygonal attic gable roof, isDepending on the type of roof covering, the device needs a high-quality thermal and acoustic insulation. The most suitable for this material is rightly considered to be basalt insulation, available in mat or thick rolls of 50 and 100 mm. Furthermore, basalt rockwoolcharacterized by very low water absorption, resistance to formation of fungus, and its fibers having a multidirectional arrangement perfectly quenched with sound waves, providing the room acoustic comfort. Tip! The thickness of the insulation layer were arranged in a mansard roof structure should not be less than 150-200 mm, otherwise the heating costs are unreasonably high. Each truss system attic gableroof being built with his own hands, the device requires a waterproofing layer which is located between the roofing material and insulation. In his role can act as a simple roofing material (not the most practical option), as well as modern polymeric waterproofing membranes that are being targeted to the rafters staple gun. Thereafter, fixed between raftersselected heater, which is closed from the inside vapor barrier membrane - it completely eliminates the accumulation of moisture in the mineral wool, which has a positive effect on its thermal insulation characteristics. Upon completion of these works, the device begin to interior decoration of the new premises, which can be used for any material (drywall, OSB-plate, battens).